Its been awhile since I’ve written a blog which feels kind of weird but I missed it. Yesterday was overwhelming because I didn’t know who was going to work or what I was going to do. Well I was waiting in front of the Dunkin’ Donuts in the cold weather then when I saw all of the Save the Harbor, Save the Bay crew members which brought back so many memories of enjoying fishing, visiting Spectacle Island, and the Fishing Tournament. Then we got there and Carolyn split us up into groups and in my mind I’m like wow, it’s freezing! Then we were just walking around waiting when Bruce came up to Carolyn and I and said we should adopt the Photography Club of the Boys and Girls Club, which was pretty cool. A lot of the kids were just focused on the blue marbles and finding them throughout the beach. Then I took a nice walk on the beach looking at the different colored shells, going to the beach in the fall is absolutely amazing. A little while later we went on a nature hike with the kids and they were just looking at different objects to take pictures of which was cool because I remember when I used to be a part of that club and we visited different places. At the end of the day I just enjoyed and had many laughs with the kids because that’s the purpose of Save the Harbor, Save the Bay, making it the best experience any child could have and knowing they made the best of it. Hi everyone! It's Rusenny! It's been so many weeks since my very last blog post on the last day of summer, and making this one brings back so many of the wonderful memories that I made this summer! 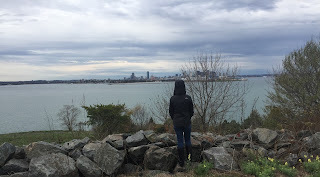 Yesterday, October 29th, I got the chance to visit Spectacle island after weeks of saying goodbye. I was really surprised at how many people began to show up with their kids all bundled up, not letting the cold October weather stop them from exploring Spectacle. As we were all getting on the boat we took a huge group picture which made it feel like summer all over again (with the non-stop photos)! It was cold, but it was worth it. It wasn't until we got on the boat and started passing each Boston Harbor island, that I realized how much I had missed these wonderful views. Everything looked a bit different from the summer, some of the trees were almost leafless, and the grass looked much greener rather than the yellow color it usually had from the harsh summer sun. When we got to Spectacle, for many it was their very first time and they began to explore the island right away. Many of the kids, and even parents were very excited in looking for the blue marbles that were hidden all around the island with there being a prize of a free plane ticket to almost anywhere. We also took walks up to the top of Spectacle with small groups and talked about the island and the things that we most loved about it. 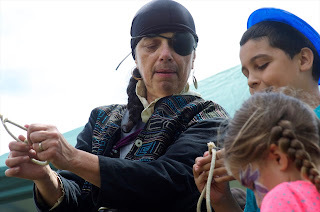 Norah Dooley was also there telling some of her pirate stories to the kids. I could tell everyone was having a blast and it felt nice to be back. I can't wait to see what awesome memories this upcoming summer will bring. All Aboard for Spectacle Island! 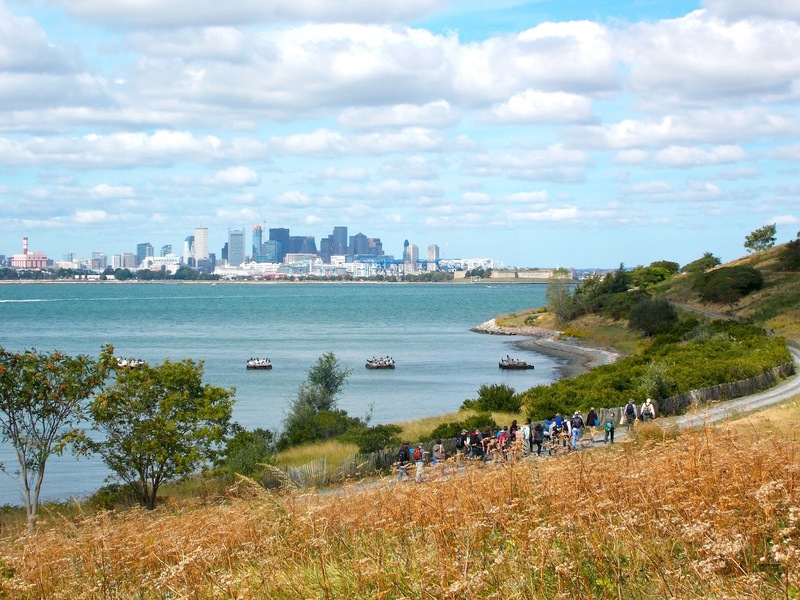 On Saturday, October 29th, Save the Harbor/Save the Bay will host a free "Treasures of Spectacle Island" cruise to enjoy a fall day on DCR's Spectacle Island in the Boston Harbor Islands National and State Park. Join us to hunt for sea glass and artifacts on Treasure Beach, hike the North Drumlin for a view of the city and the harbor, and learn about the fascinating history of this unique island. Thanks to our partners at Mass Humanities, storyteller Norah Dooley will once again join us as Mary Read the Pirate to share stories of Boston Harbor and encourage you to share your stories as well. We will begin boarding the Provincetown II at Bay State Cruise Company's dock at the World Trade Center in the Seaport at 9:30 AM for a 10 AM departure. The boat will return by 2:30 PM. The snack bar aboard the Provincetown II will be open, but the snack bar and visitor's center on Spectacle Island will have closed for the season. You are welcome to bring a picnic lunch-- please remember that the Boston Harbor Islands National and State Park has a "carry-on, carry-off" policy, so bring a bag for your trash! Dress warmly for this trip! Temperatures on the harbor will be cooler than those in the city. Reservations are required. Though there is plenty of room on the boat, space is still limited, so please RSVP by email to gaylord@savetheharbor.org or call Amy at 617-451-2860 x1008. Please give us an accurate headcount so that we can accommodate as many guests as possible. Please remember that any sea glass or artifacts found on the island must stay on the island for other visitors to enjoy! We do encourage you to find and keep one inch blue frosted glass marbles that you find on the beach, as they are your ticket to enter the 5th Annual Simply Marble-ous Treasure Hunt for JetBlue Flights! Just post a picture of yourself with the marble to Save the Harbor's Facebook! Please feel free to share this flyer with others who may be interested in taking advantage of this free opportunity. To learn more about Save the Harbor/Save the Bay, visit our website, like us on Facebook, and follow us on Twitter and Instagram @savetheharbor. Thanks to Bay State Cruise Company, the Mass Environmental Trust, Mass Humanities, the Department of Conservation and Recreation, the National Park Service and all our foundation funders, corporate partners and individual donors for their support of this free cruise. Save the Harbor's free youth environmental education and family programs are made possible with Leadership Grants from Bay State Cruise Company, Blue Cross Blue Shield of Massachusetts, The Boston Foundation, The Coca-Cola Foundation, Distrigas/ENGIE. Save the Harbor is grateful for Partnership Grants from Forrest Berkley & Marcie Tyre Berkley, The Clowes Fund, Comcast, Eastern Salt Company, Inc., Fan Pier - The Fallon Company, John Hancock Financial Services Inc., Kershaw Foundation - Cheers for Children, Mass Environmental Trust, Mass Humanities, Massachusetts Bay Lines, Massachusetts Port Authority, Massachusetts Water Resources Authority, P&G Gillette, William E. & Bertha E. Schrafft Charitable Trust, Vertex, Mark Wahlberg Youth Foundation, The Yawkey Foundation. Save the Harbor also appreciates funding support from Arbella Insurance Group Charitable Foundation, Blue Hills Bank Foundation, Blue Hills Bank Pavilion, BOMA, Boston Properties - Atlantic Wharf, Camp Harbor View Foundation, Clipper Ship, Foundation, Inc., The Daily Catch Seaport, Elizabeth Elser Doolittle Charitable Trust, Emera Inc., Paul & Phyllis Fireman Charitable Foundation, Thomas & Lucinda Foley, The HYM Investment Group, LLC, Lovett-Woodsum Foundation, Massachusetts Convention Center Authority, National Grid Foundation, The Reebok Foundation, RMR Real Estate Services, Lawrence J. & Anne Rubenstein Foundation, Skanska, South Boston Community Development Foundation, Spectra Energy, Tishman Speyer. Save the Harbor would also like to thank our supporters 3A Marine Service, AP Staffing, Andus Baker & Rowan Murphy Family Fund, Bay State Federal Savings Charitable Foundation, Andrew J. Calamare & Marianne Connolly, Circle Furniture, The Fuller Foundation, Inc., Legal Sea Foods, Miss Wallace M. Leonard Foundation, Sherry & Alan Leventhal Family Foundation, George Lewis - Haven Trust, Liberty Bay Credit Union, Mass Bay Credit Union, National Park Service, Nicholson Foundation, Randy Peeler & Kate Kellogg, Red Sox Foundation, Rockland Trust Charitable Foundation, Storm Duds, Matthew J. & Gilda F. Strazzula Foundation, TD Bank Charitable Foundation, UDR, Kyle & Sara Warwick, Matthew Whitlock & Penny & Neal. Hi everyone! 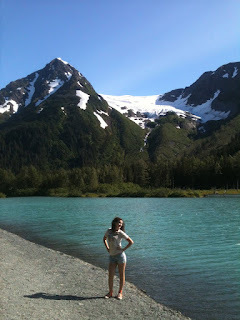 My name is Melissa, and I am very excited to be one of Save the Harbor/Save the Bay’s new environmental policy interns. I graduated this May from Clark University, where I studied Environmental Science and Policy and clarinet performance. When I wasn’t studying Brahms and Beethoven, I was coming to understand the close but complicated relationship between environmental policies, sustainability, water quality, and public health. My time at Clark allowed me to foster my passion for water; I was able to study water quality and water contaminants, while also working closely with the university to promote campus water sustainability by upgrading the irrigation system. Since my start at Save the Harbor just a few weeks ago, I have hit the ground running. My fellow intern Alicia and I were tasked with finding out everything there is to know about the smelly, brown algae that plagues beachgoers in the North Shore. The algae, formally known as Pilayella littoralis, are an algae that naturally grows on rocks in the water, but can detach and float freely with the waves. When the decomposes on the shore, it releases sulfur gas, which smells an awful lot like rotten eggs. The algae in the Nahant Bay poses a peculiar dilemma; unlike the Pilayella in other parts of the world, this Pilayella has learned to multiply on its own, so it can double its body weight in just six to ten days. While this is fascinating from a biological standpoint, it makes the algae-smell problem particularly difficult to manage. In addition to my research, I was also recently able to a beach cleanup of Tenean Beach and Savin Hills Beach with Vertex Pharmaceuticals. Despite the looming threat of rain and the blustery winds, we worked all day to improve the beaches, ultimately removing 80 bags of debris from the beaches. It was so fun to have the opportunity to get my hands dirty and contribute to the community! I have enjoyed being able to become so involved so quickly, not only by supporting policy initiatives in the office, but also getting out into the community and helping with my hands. I am so excited to be a part of this amazing organization, and I can’t wait for the experiences to come! Keeping a close eye on Matthew. Thanks to our friend Richard Honan of Winthrop for sending us this useful list of hurricane tracking sites. The National Hurricane Center (NHC) is the place to find the official tropical cyclone forecasts and warnings issued by the US government for the North Atlantic as well as the Eastern North Pacific. The site has many resources available with excellent satellite photos, computer model guidance and an archive of past historical tracks going back into the 180o’s. The NHC site is user friendly and comes in full feature, mobile and text onlyversions with easy access to the latest storm info, official advisories, marine forecasts and much more. Hurricane Matthew coverage HERE. The Weather Underground Tropical Weather Page is a very comprehensive and easy to use site which provides excellent tools for storm tracking for both the professional and the amateur. The site is available in a full (graphics heavy), a lite version, a mobile version and an iPhone version. This site allows you to track tropical cyclones anywhere on the globe with interactive maps that allow overlays of computer guidance, forecast tracks, many satellite images and features several excellent weather blogs. Hurricane Matthew coverage HERE. The Naval Research Lab (NRL) Monterey Marine Meteorology Division Tropical Cyclone page is another useful site that provides global storm tracking with comprehensive satellite and forecast track information on tropical cyclones across the globe. This site is heavy on satellite images and is oriented a bit more to the professional user. Hurricane Matthew coverage HERE. Stormpulse is a commercial site that offers both current and archive tracks on an interactive map that allows you to overlay satellite, radar and surface data. It has a unique feature that allows you to quickly check how far the storm center is from major cities/ports. Hurricane Matthew coverage HERE. Tropical Cyclone Guidance Project (TCGG), part of the National Center for Atmospheric Research (NCAR), provides real-time guidance and information for major storms, including Hurricane Mathew. The site uses data from a variety of modeling centers outside of the NCAR, such as NOAA, other national numerical weather prediction centers, and universities. Hurricane Matthew coverage. Cooperative Institute for Meteorological Satellite Studies (CIMSS) – University of Wisconsin – This is an excellent site for the more technical user with numerous overlays of meteorological analysis tools, satellite photos and surface observations. Unisys Hurricane Data page provides an extensive global archive of current and past tropical cyclones. NASA often provides great satellite imagery for major hurricanes and cyclones. Check out their page for Hurricane Matthew. NOAA’s Satellites and Information website also provides satellite imagery of major storms in near real-time. Also be sure to check out Tropical Tidbits, a blog that focusses primarily on tropical cyclones and related topics, as well as Mike’s Weather Page at SpaghettiModels.com, which is a mash-up of various official models and information. 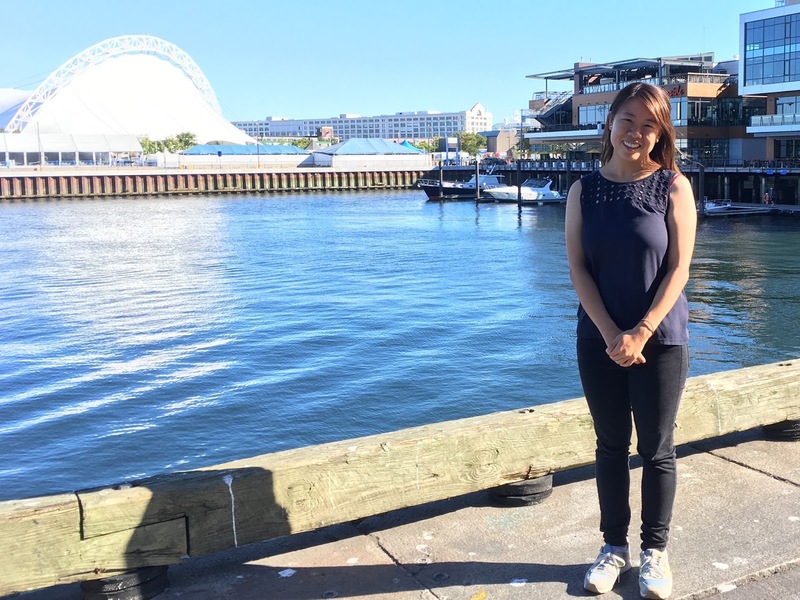 My name is Alicia Zhao and I’m one of the new Environmental Policy interns. Originally from the Bay Area in California, I moved to Newton during my junior year of high school, then attended Cornell University in upstate New York. 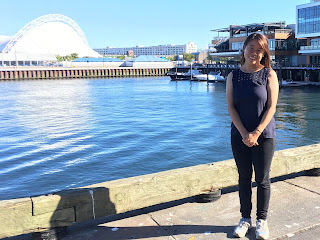 After graduating with a degree in Environmental Biology, I jetted off to Japan for an English teaching job, and two amazing years later, I have returned to the Boston area. I first became interested in environmental conservation while in high school. My AP Biology class required a year-long environmental service project, and as someone who has always loved animals and children, I chose to partner with the Massachusetts Society for the Prevention of Cruelty to Animals. Working together, we created lesson plans about animal endangerment, which I taught to local elementary school students. This was a life-changing experience that pushed me to pursue environmental science in college, where I focused my studies on aquatic organisms and ecosystems. During my senior year, I worked at the Cornell Biological Field Station on Oneida Lake, researching the effects of invasive mussel species on lake dynamics. 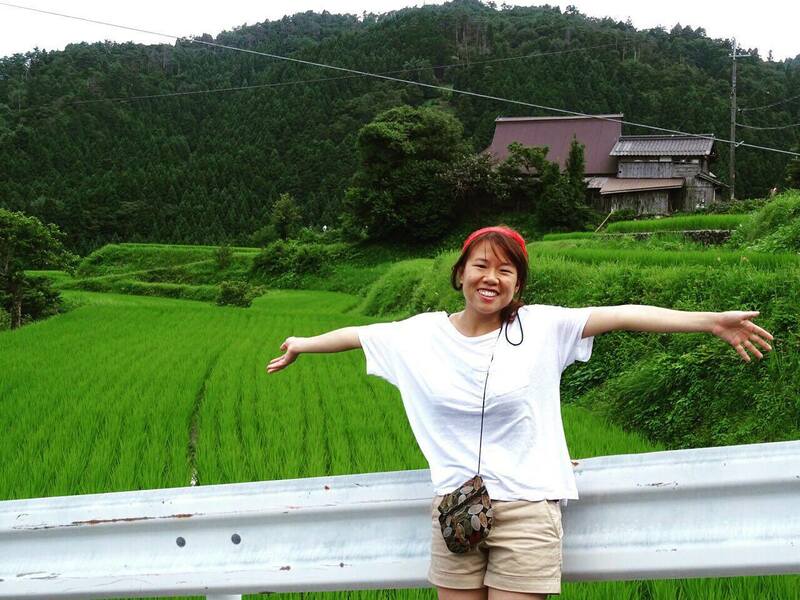 Following graduation, although I was still passionate about the environment, I also wanted to explore my interests in education and Japan. To fulfill this dream, I decided to teach English at two elementary schools in western Japan. I was fortunate to have lived in the countryside during my two years there, biking past misty mountains and endless rice paddies on a daily basis. I became fascinated with the way Japanese people appreciate and maintain their natural resources, something which, upon my return to the States, inspired me to seek work at an environmental nonprofit organization. Save the Harbor/Save the Bay, combining both my interest in education and environmental conservation, was the perfect opportunity for me. Despite the small size of the organization, there is a lot going on in the office, and I have already played a part in various projects. Some of these projects include organizing press clips, researching and writing about a species of algae infesting Boston beaches, making phone calls to local organizations, and participating in and writing press articles about our beach cleanups last week. Every day has been interesting and a great learning opportunity; I’m looking forward to the next few months here! Hello again, friends of Save the Harbor! It is truly exciting to be back at Save the Harbor/Save the Bay. For the last weeks of August, I had the opportunity to rejoin our staff at sites in Boston and on our stunning Harbor Islands. The most memorable adventure of my summer was going on my first fishing trip with the Camp Harbor View Fishing Club. 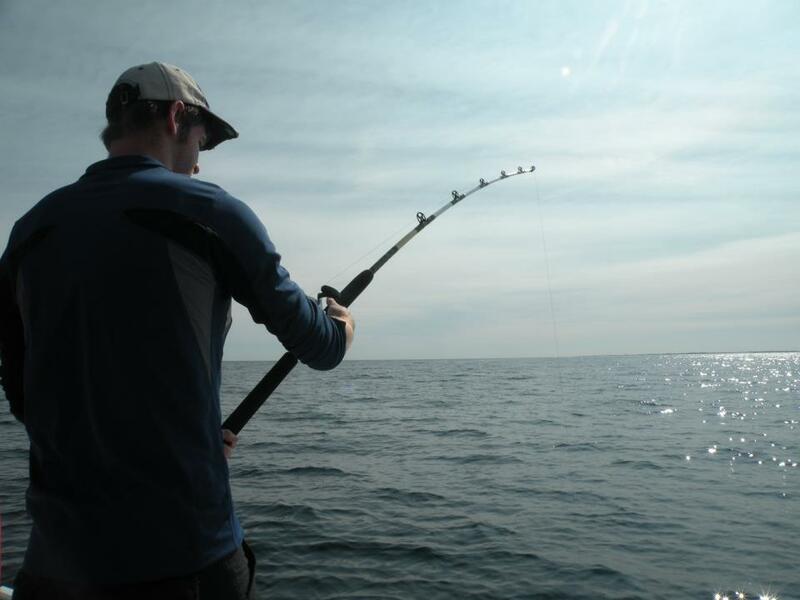 You really can't beat spending time fishing off a boat with an enthusiastic group of camper. The summer ended too soon, as it tends to do. If you are worried that you missed your chance to catch a view of Boston from the sea, you're in luck- Save the Harbor/Save the Bay has fall plans for you! 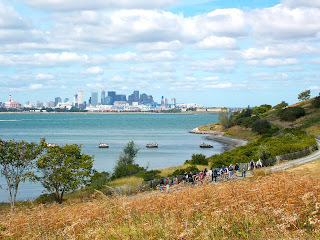 Join us for a free cruise to DCR's Spectacle Island on October 22nd. As for my fall plans, I am back at our office on the Fish Pier. I have wrapped up a busy start as an Environmental Policy Staffer, and have already enjoyed some time on the beach. Save the Harbor has a strong commitment to protecting and sharing the Boston Harbor throughout the year, and I am lucky to be a part of these efforts. As busy as the fall can be, I am enjoying some special perks from Save the Harbor. We famously send fish home with the children and summer staff that catch big enough fish at our youth program sites. My boss, Bruce Berman, has far more luck (and skill) than I do when it comes to fishing, and at the office, we all benefit. He brings us smoked fish from the pier, and I brought home a filet of sea bass that Bruce caught, de-boned and froze. I marinated the bass in lemon juice, fresh herbs, and olive oil. The resulting fish tacos were unbelievable, Quality flavor comes from fresh, healthy, local catches. To the tune of celebrating our local, natural resources, Save the Harbor is fortunate to have help from our partners and communities. This past week, we took time out of the office to meet some of our corporate partners on the shore for hands-on cleanups. Cleanups like these keep us connected to Boston's coastline throughout the year, and despite some gloomy weather, conversations were up-beat and all of our teams enjoyed making a difference. We made the most of time away from our desks, and everyone felt how sincerely rewarding it is to give back to our communities. Finally, aside from all of the perks of my new position, I am looking forward to the in-depth policy work I will do this fall. I am pleased to announce that I was accepted to the Fletcher School of Law and Diplomacy, and through their Map Your Future program, will begin my Masters' of Arts in Law and Diplomacy (MALD) in September, 2018. At Save the Harbor, I will gain the high-level policy experience I need to prepare me for the next exciting chapter in my life. The fast-paced work environment and interdisciplinary nature of my projects present exciting intellectual challenges and rewarding experience payoffs. I am glad to be starting the fall off on the right foot. Stay tuned for more news from the harbor, and I hope to see you all at Spectacle Island! Hi everyone! My name is Trevor Etheridge and I am a new Environmental Policy and Communications intern at Save the Harbor/Save the Bay. 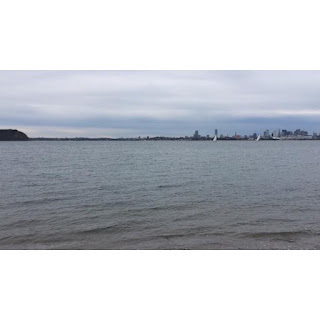 As a recent graduate of Boston University’s Marine Science program, the Boston Harbor and surrounding beaches will always hold a special place in my heart. Though my first love will always be the rock strewn tidal beaches of Maine where I spent my summers as a kid, I am very happy to dedicate my time to the preservation of the Boston area’s equally impressive beaches and waterfront. In my first weeks at Save the Harbor/Save the Bay, I have been continually blown away by the incredible work that has been done to protect and preserve the harbor. Whether working alongside volunteers to clean up nearby beaches or helping to continue to spread Save the Harbor/Save the Bay's message of conservation and environmental stewardship, I cannot wait to continue my work with this innovative organization! I am also deeply impressed with the key roll Save the Harbor/Save the Bay has played in the transition from Boston’s harbor being “the dirtiest harbor in the country” to having some of the country’s cleanest urban beaches. Much of my time in college was spent running and kayaking along the Charles so I am very invested in preserving these outstanding community resources and honored to work alongside an organization that has shares this passion. Save the Harbor/Save the Bay’s commitment to community outreach and promoting the next generation of ocean stewardship are also some of the main factors that attracted me to this internship. It is my belief that without a strong community investment in your cause it is nearly impossible to enact lasting change. By building such a large support base from Nahant to Nantasket, I fully believe that Save the Harbor/Save the Bay will continue to inspire long lasting change in these communities and I cannot wait to do my part to aid this organization! On Friday, Sept 30, 75 volunteers from Vertex Pharmaceuticals joined Save the Harbor/Save the Bay and the MA Department of Conservation and Recreation for a blustery day of corporate citizenship on two area beaches. The stormy weather didn’t affect productivity as the energetic "Vertexians" removed truckloads of weeds and overgrowth, stained benches, and cleared trash along DCR’s Tenean Beach and DCR’s Malibu/Savin Hill Beach in Dorchester. and the MA Department of Conservation and Recreation to clean up Tenean Beach in Dorchester. In the morning, the first team of “Vertex Volunteers” cut weeds along the seawall, shoveled sand back onto the beach, removed trash and debris from the parking lot and sidewalks, and stained benches with Australian Timber Oil. 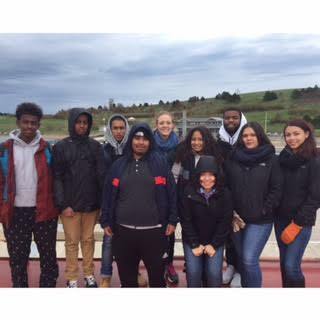 The second team of “Vertex Volunteers” turned their attention to Malibu and Savin Hill Beach in the afternoon. While some cleared weeds along the boardwalk and seawall, others cleaned up the boat ramp and beach on the other side of Morrissey Boulevard, removing tons of trash. Malibu/Savin Hill Beach in Dorchester. By the end of the day, the crew had donated over 400 hours of service, filling three 1-ton truckloads of debris with over 80 bags of trash. Save the Harbor is a non-profit, public interest harbor advocacy organization made up of thousands of citizens as well as civic, corporate, cultural and community leaders and scientists whose shared mission is to restore and protect Boston Harbor, Massachusetts Bay, and the marine environment and share them with the public for all to enjoy. Mike Parsons of Salem, Cameron Moody of Lexington cleaning up Malibu Beach. To find out more about Save the Harbor/Save the Bay and the work we do to restore and protect Boston Harbor, the Boston Harbor Islands and the region’s public beaches from Nahant to Nantasket, visit our website at savetheharbor.org and follow 'savetheharbor' on Facebook and Twitter. 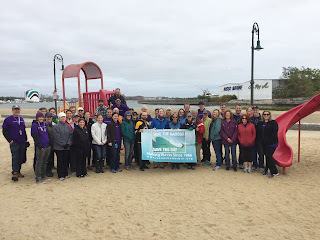 On Wednesday, Sept 28, 67 volunteers from Blue Cross Blue Shield MA partnered with Save the Harbor/Save the Bay and the MA Department of Conservation and Recreation to clean up Carson Beach in South Boston. Undeterred by inclement weather, the spirited volunteers removed weeds and overgrowth, painted shade shelters and cleared sidewalks and pathways from the McCormack Bathhouse to Pleasure Bay. The “Blue Crew” began the day with trash bags, shovels and rakes, removing invasive Sumac, weeds and debris from Carson Beach to Pleasure Bay. Additionally, four teams of volunteers painted 15 shade shelters and the doors and trim of the McCormack Bathhouse. In the afternoon, the enthusiastic volunteers cleared sand-filled pathways along the Harbor Walk near Mother’s Rest. They also cleared an entrance ramp at the N Street Beach to improve access for a handicap neighbor. The BCBS Carson cleanup also contributed to the health and wellness of the participants. By the end of the day, volunteers had logged approximately 15,000 steps, which is equivalent to over 7 miles, according to Woods. Anne Marie Flaherty of Brookline and Vito Palazolla of Dracut share a laugh as they clean up the I Street Beach in South Boston. Maya Durm of Rockland, and Claire Gongas of Hingham prepare to clean up Carson Beach. Save the Harbor/Save the Bay is a non-profit, public interest harbor advocacy organization made up of thousands of citizens as well as civic, corporate, cultural and community leaders and scientists. Our mission is to restore and protect Boston Harbor, Massachusetts Bay, and the marine environment and share them with the public for all to enjoy. To find out more about Save the Harbor/Save the Bay, visit our website at savetheharbor.org and follow ‘savetheharbor’ on Facebook and Twitter.